Charlotte T Apr.27 Carolina T.
The East Coast Basketball League, a minor league based in the Southeastern United States, has announced the addition of a new team for the 2019 season, based in Winston-Salem, NC. The team will be operated by Marcus Shockley who is the founder and Executive Director of Neptune Media Group, parent company of NetCast Sports Network, a publisher of sports related programming for broadcast television and live streaming. Additionally, Shockley's past experience has been in creating and managing national high school basketball showcases which were featured in SLAM magazine and on ESPN's Top 10; Producing broadcasts for pre-NBA draft camps such as the Portsmouth Invitational, and financing various elite high school and pro basketball combine events. 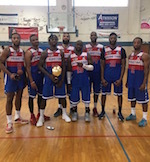 'Minor league basketball is tough to get traction in, here in the U.S. Market,' said Shockley, 'but I really like what the East Coast Basketball League has done and I didn't want the Triad (NC) area to be left without a team. We bleed basketball in North Carolina and the Winston-Salem, Greensboro area is no different. Our goal is to be competitive in our first year and create a community environment for fans in the area.' Kishon Bishop will be working with Shockley and brings the experience of organizing the Triad All-Star Classic each year, which features the top players from the regional high schools, as well as running several events such as the Blue Chip fall league and the Triad First 48, an elite high school event. Bishop also previously played for the national team for his birth country of St. Vincent & the Grenadines and organized the Triad Pro Am summer league for several years. The Wolves will replace the Winston Salem Certified franchise which where released prior to league scheduling and will begin play in March of 2019. The PrimeTime Players leaders of the Southwest conference hosted the leaders of the Northwest conference the Petersburg Cavaliers in the featured game of the week on Netcast Sports Network. The first quarter opened up with the visiting Petersburg guards Anthony Jones and Earl Gee (5'10''-PG, college: Longwood) II combining for 20 of Petersburg 29 first quarter points by hitting multiple mid range jump shots and easy transition baskets. PrimeTime was able to keep pace throughout the quarter behind a dominate performance from Odell Turner (6'8''-F-91, college: Wingate) who finished the first quarter with 16pts and 10 rebounds as he helped PrimeTime finish the 1st quarter with a 33-29 lead. The second quarter Trey Suttles (6'5''-F, college: Tenn Wesleyan) scored 14 and PJ Heath added 9 as PrimeTime was able to outscore the Cavaliers 38-20 in the quarter, PrimeTime closed the quarter on a 11-0 run with Chris Moore scoring 7 points in the last twenty seconds to help blow the game open. The second half PrimeTime continued to add to the lead as Zeriq Lolar (6'2''-G, college: Wingate) scored 11 of his 24 in the second half and Trey Suttles added another 14 to finish with a game high 28. The game was played under Elam Ending rules, where the game clock is stopped at the first dead ball under the 3:00, at the first dead ball the score was 133-99 with a target score of 140. PrimeTime was able to close out the Elam Ending scoring on three straight possessions with Zeriq Lolar hitting a three pointer, Chris Moore a back door layup, then on a fast break Lolar assisted to Suttles to end the game at 140-99. The win moves PrimeTime Players to 7-0 with a trip to Florence next week and the Petersburg Cavaliers drop to 5-2 and will host the Rowan County Bulls this week. The PrimeTime Players traveled to Augusta to play the Eagles in their second Southwest Division matchup of the season. The visitors opened the first quarter knocking down 8 three pointers led by Terell Smith knocking down half of those in the quarter, but the home team Augusta Eagles closed the quarter on a 8-2 run behind 14 point from Matthew Todd (6'3''-G, college: Francis Marion) as PrimeTime Players led 26-24 at the end of the first quarter. The second quarter both teams played even throughout the quarter until the last minute when PrimeTime was able to close the quarter on a 15-2 run with 13 of those coming from Diondre Pratt (6'4''-G-94, college: JCSU) as they pushed the lead up to 53-42 going into halftime. The second half PrimeTime continued to open the lead up as Trey Suttles (6'5''-F, college: Tenn Wesleyan) knocked down a quick pair of three pointers and John Britton (6'8''-C/F-89, college: Anderson, SC, agency: HMS) banged out 12pts in the paint to go along with 7 rebounds as they opened up a 26pt lead at one point before going into to 4th with a 87-67 lead. The fourth quarter both teams opened up the scoring combining for 83 points, but the closest that Augusta Eagles would get would be 17 which ended up being the scoring difference in the end of the 127-110 PrimeTime Players win. The Charlotte Tribe and PrimeTime Players met for the 1st of two games this season Saturday at Banks Street Gym in Fort Mill with both teams coming into the game at 3-0 and tied for 1st in the ECBL's Southwest Division. The home team opened up strong in the first quarter jumping out to a 32-18 lead behind the outside scoring of guards Diondre Pratt (6'4''-G-94, college: Johnson C. Smith) and Zeriq Lolar (6'2''-G, college: Wingate) who combined for 18 in the opening quarter. The second quarter Diondre Pratt again had another big quarter scoring 10 of his game high 38pts but the inside side game of John Britton, Odell Turner, and PJ Heath was the biggest difference in the first half as they combined for 10 offensive rebounds and also accounted for 31pts as PrimeTime went into the half up 67-45. The second half Charlotte's big man Bernard Sullivan (6'8''-F-92) put in some great work trying to bring the Tribe back by scoring 13 of his 23pts in the 3rd quarter and guard James Murray added 17 of his 24 in the 4th quarter but the Tribe were never able to get closer than 18 in the second half. The win moves PrimeTime Players to 4-0 on the season and they will travel to Augusta on Saturday the 30th and then the same Augusta team will then travel to Charlotte for a Sunday matchup at 3:00pm at Bailey Middle School.